This free-to-play atmospheric point-and-click episodic adventure game with stylized visuals and an eerie soundtrack is split between two eras four decades apart and centers around an average guy named Joe who works in a government building as a janitor in present day 1972. One day while Joe is mopping up the sub-basement laboratories he discovers a trail of blood that leads him to an old man who has been shot and dying and who claims to be from 2012 and has come back in time to save the future from it becoming a post-apocalyptic wastland. The dying man tells Joe it is now up to him to find his younger self in 1972 and warn him what will happen in the future. Joe finds himself left with the stranger’s portable time travel device which he must use to jump between 1972 and 2012 to help solve the game's puzzles. 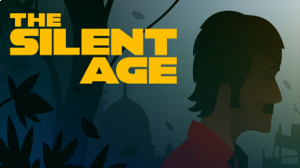 No discussions open for The Silent Age at the moment.